Here I'm sharing my learnings, projects and experiences with CNC 3040 router/milling/cutting machine I have in my garage. Here I will include all the projects I will make with the Arduino processor and accessories. You are welcome to comment, and share. Since the last post I have worked hard in the design and build of the Wood/Plastic clock. I have made a lot of changes in the original design, and I think that the final result is really a very nice clock! Use new and sharp bit or a sharp bit that has been used only in plastic. If you used a bit to cut wood, forget to use it later in plastic. You need to remove very little material each pass :. 24,000 RPM spindle speed and 10 inches/minute feed rate. Keep the bit cool with compressed air. For the internal cuts I used a 1/8” 1 Flute end mill. You also need a new and sharp bit or a sharp bit that has been used only in plastic but feed and RPM are different: 15,125 RPM, 16.1 Inches/minute feed rate and .004” maximum step down per pass. The other complicated thing is to bond brass and acrylic. After several test I ended using 2 part transparent epoxy. Here is a video showing several details of the clock. I love the action of this clock! 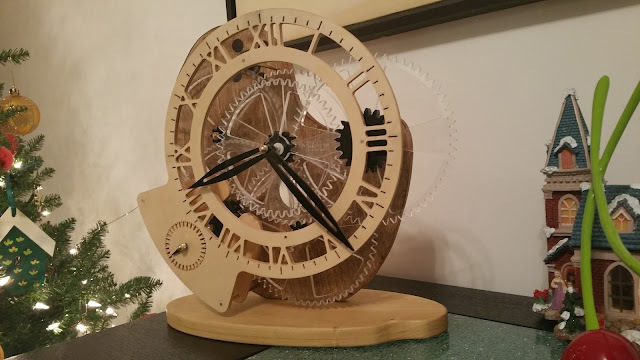 Carlos, that wooden clock made from your CNC machine looks amazing! My little brother loves wood working, but doesn't have access to a CNC machine. It seems like there are endless creations to be made using this type of machine. Did you go to school to learn this, or did you just figure it out? You do great work. Jake, Thank you for your comment. To make wooden clock it is not really necessary a CNC. With a scroll saw and son simple tools it is possible to start. I recommend you to click in the Clyton Boyer link. You can buy there full building plans of the fantastic clocks Clyton design. He also sell a very helpful pdf book that will teach you the basics. Once you make the first and feel the wood in your hands you either love it or hate it. Please be aware that any comment with commercial links will be immediately deleted and declared as SPAM. If you want to advertise in my blog please contact me to agree in a fee and i will be happy to add your link in the side bar.